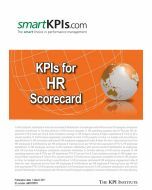 The HR Scorecard is a ready-to-use tool, pre-populated with KPIs grouped by objectives and Balanced Scorecard perspectives. 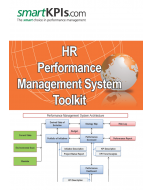 It illustrates the application of the Balanced Scorecard concept at operational level and can be employed as part of the HR department performance management system. As a performance management tool it assists in monitoring the alignment of departmental objectives with KPIs and in tracking their achievement. - Customer: how do our internal customers see us? - Financial: how do we satisfy the financial expections of the stakeholders? - Internal Processes: at what processes do we have to excel? 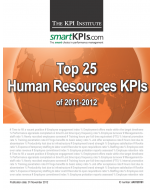 - People, Learning & Growth: can we continue to improve and create value for the organization? Helicopter view data - contains the HR indicators that offer a broad perspective on the HR department's activity and status, such as the number of HR team members or HR budget value. Data repository - tab used to collect performance data for KPIs and list the targets and tollerance limits established for them. 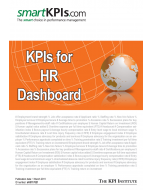 KPI catalogue - the repository of descriptive data characterizing each KPI monitored in the Scorecard. 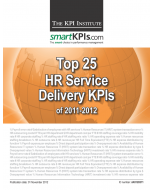 Each KPI is documented based on the best practice KPI documentation template proprietory to smartKPIs.com and available in the smartKPIs Premium section of the website. There are over 30 fields of metadata specific to each KPI, from KPI name to definition, subordinate measures, calculation formula, etc. KPI description - presentation page for each KPI, in a print friendly format, enabling clear communication around it by making it specific and inteligible for everyone using it. KPI record - graphical representation of historical results and comments for each KPI, together with aditional notes. Aligning the activities within the department in order to fulfill its role and corelate its strategic plan with the organizational strategy. Template design developed based on specifications prepared by Aurel Brudan, smartKPIs.com's Performance Architect and a leading expert in organic performance management.